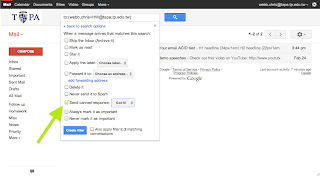 TAPA Room 210: GMail + canned responses = no more "TEACH-AH, DID YOU GET MY EMAIL?" GMail + canned responses = no more "TEACH-AH, DID YOU GET MY EMAIL?" Once upon a time, TAPA students used to take every quiz on paper. To make sure their teacher got that quiz, they would stand up, walk to the front of the room, and hand that paper to the teacher. Then they would quietly sit back down in their desks with full confidence that the teacher received their work. How annoying! If only there was some automatic way of responding to students messages, so they'd instantly know if you received the assignment or not. Guess what? Thanks to a new setting flipped on by Mr. Bennett, we've got it! Here are the steps to do exactly that. If you do not see Labs at the top, restart the browser and try that link again. It should eventually work for you. Once it does, click on it. 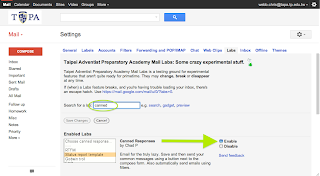 A list of Labs, or optional GMail features, will appear. 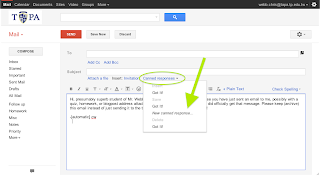 Search for "canned responses" and Enable those. Write a "canned response." 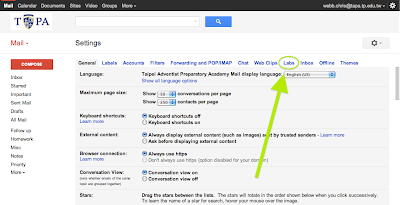 Click on Compose to get to a new email. Write an email that essentially confirms that you received the homework/quiz/whatever from whomever. (Note: You do not need a To: or a Subject line.) When you're done, you'll click on Canned responses and Save it as a New canned response . Once it's been saved as a Canned response, you may Discard the email. Make sure you add the +hw part before the @ symbol. 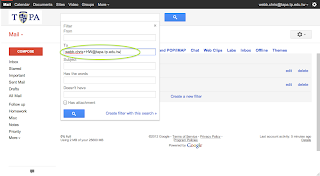 Once you do, click Create filter with this search . Under Send canned response, select your message you just created and make sure the box is checked. Finally, click Create filter . (Optional) Test it. Want to see how it works? Go to this page (not spam, I promise) and enter in your new email address. By the time you get back to your email, you'll have both the email sent to you (by the testing service) and your automatic "canned" response. Easy, huh? Want to know how that + stuff works? Basically, every GMail (and by extension, TAPA email) address automatically has unlimited sub-email addresses after the plus. You can add a plus sign before the @ symbol and type in whatever you want—as long as it's one word (no spaces) and no punctuation, it'll make it to your inbox, and you won't even see the difference. I use this all the time when I sign up for websites that I'm worried might eventually spam me. When I sign up, I just type my email address as mypersonalemailaddress+riskywebsite@gmail.com, and then I have a filter that takes anything sent to that address and sends it straight to the spam filter. Out of sight and out of mind.